The excitement builds. Also the nerves. Have you ever noticed how, when you travel to a completely new environment, all emotions are magnified? The joys are expansive, the fears are bottomless, each event rings clear, vibrates with color. I feel I should go to bed wearing dark sunglasses! And yet, there is a penetration to truth and genuine learning, if only one can sort things out. After all, we’re not talking here about hallucinations or drugs: These are real experiences. So begins our second day of classes, Richard Mannoia and myself. Our quest, perhaps quixotic, is to bring a program of children’s creativity, (our Very Young Composers) to the vast and vastly successful El Sistema. As Maestro Jose Antonio Abreu’s program spreads throughout the world and revolutionizes music education, children and societies, so we wish to present ourselves as composers’ advocates, and release the miraculous creativity that is in children everywhere. Patience. Patience and persistence. This is going to take awhile. It is thanks to the New York Philharmonic, the Halbreich Foundation, El Sistema’s invitation, and countless supporters and friends that we are even here. Taking a last gulp of the marvelous Venezuelan coffee, I rush to the lobby, where we drive to the Teresa Carreño Theater. The theater had been commandeered by the Chavez government for its sole use until recently, when the immense popularity of El Sistema’s music program was recognized, and is now open to them. Onstage, Gustavo is rehearsing. Hearing the first measures of the vast first movement, my eyes immediately widen, my jaw threatens to drop, and I am in a different world. Now, I had heard, very briefly, this orchestra in rehearsal in Carnegie Hall, and had worked with the Orquesta Juvenil de las Americas. The prowess of these young people was not unknown to me. And yet somehow hearing them this morning, not only the energy, brilliance and accuracy of ensemble and intonation were streaming out like fireworks, but it was clear that Gustavo was shaping the work in such a penetrating, passionate way, that you could tell an important musical statement was about to break forth. The control, the rhythmic drive, the ensemble, especially in the strings, was palpable. Marvelous horn solos, viola, flute. . . and on and on. Rather dazed, I wander out to stage-left during intermission, and talk to the violas and bass players. Gustavo is in the center of a presentation: He is receiving the Legion d’Honneur from the French government for his service to music. I’m feeling like a tiny flea on the wall, delighted and all, but how can I hope to be of any help to all this? I’m just glad to be here. And yet – Gustavo, true to his form, catches sight of me, interrupts his photo-op, rushes over to give us a hug (there are lots of hugs in Venezuela!) 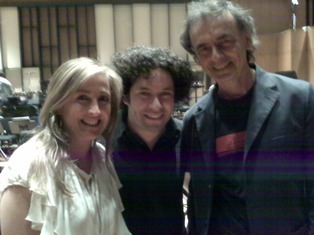 and speaks excitedly to me and Dani about the composing program. Energized and elated by the performance, and yet feeling a weight of responsibility like, yow, we go to the afternoon’s three-hour class. I hope these people don’t expect their children in seven class days to come up with great masterpieces! I mean, I know all kids are miraculous, (look who you’re talking to!) but this work does take time, after all. So the second class begins quite favorably. There are now 24 children, three new faces, and more are due for the third class. We begin with greetings and a recap of the Ear Fantasy chord and interval description game. Then, who did the assignment for bass and clarinet? Fine, almost all the kids did! And good stuff, too. Even the shy kids were willing to share. Even at this introductory stage, it comes clear that, since these kids are well-versed in solfege and reading music, that they are limiting themselves to what they can notate. In other words, they are writing from the head, not from the heart. I have mentioned this over and over already, had Dani and Pedro repeat it, but it’s not an easy thing to put aside. Again, a few of them have copied out music that they are playing in their ensembles. We talk gently about this, yet firmly. For me, the best part of the day is when Richard, again with his superb class technique and experience, helps us devise a rhythmic creative exercise as a break-out into small groups. We talk about dance rhythms, several kids even demonstrate a Joropo, Salsa, and other dances. Groups of five or six kids take about 15 minutes and devise their own take on rhythms to perform for the larger group. Each one has a special part, a contrubution. We are using hands, bodies, voices and small percussion instruments. the results are both fun and impressive. Will this translate into their own works? We will see. We cannot force, otherwise, it’s them pleasing us, and therefore not their own music at all. After class, Dani and Richard document the session, detailing each child’s progress. FESNOJIV (Fundacion del Estado para el Sistema Nacional de las Orquestas Juveniles e Infantiles de Venezuela), does make it clear that it values learning objectives for each child. As Richard says, it is not enough just to keep kids busy, but is always looking for justifiable, rich learning experiences. This is impressive, and certainly one of the reasons for El Sistema’s strength. Regular after-school classes are not held on Saturday, and yet many of the children in the Montalban district attend morning classes in the local school. 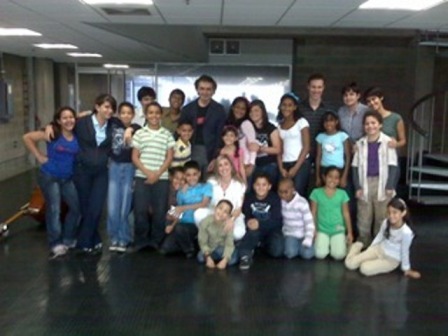 We first observed the Orquesta Infantil “Caracas.” This is an orchestra of 12-14 year-olds. Can you believe they were playing the Tchaikovsky 3rd symphony Finale, with all its complex articulations and technical writing–and with superb style? The accuracy of intonation is most evident in the strings, and yet Richard noticed that the seven or eight flutes were right on target pitch-wise. An amazing achievement at that age. One of the reasons is that they rehearse as an orchestra five, sometimes six days a week. This is unheard of with in America. I told these children we feel the whole world would be proud of them, and I meant it. Next, we heard a chorus of some one hundred children, even younger. They were singing Venezuelan folk songs, “Se Enojo la Luna,” “El Arco Iris,” and others. Of course I love to hear them honoring their own culture. And even more, the clarity of the voices, again the intonation and rhythmic unity, the heartfelt expression–how can you listen to this and not be reduced to tears? This is getting embarrassing! As if this weren’t enough, we sat in on a string sectional rehearsal. Over and over, the bowings and articulations were repeated: four sixteenths up-bow, triplet scales down-up-up, again, again and again. And there they were: Mailyn, Oscar and Luis, my composition students, playing in the viola, cello and violin sections! Pride all around, and a lot of it emanating from Richard and me. Next, a brass sectional working on Elgar’s Pomp & Circumstance. Very young kids. Excellent technique, always involved, asking questions, the teacher gentle, yet in control. Next, to a room of pre-schoolers. I would have taken their ages as 2 or 3, they were SO small, but when I asked them their ages, they held up 4 or 5 fingers. A teacher at the piano, smiling, clearly enjoying herself. Dalcroze influenced, most likely. El Sistema does nothing if not learn from the best techniques in the world, then adapting them to their own local genius. And finally, a recorder class, or Flauto Dulce. Elementary school age kids. Here we could begin to see how the basics and the solfege are imparted. They sing, then play. Play, then sing. Yes, they used a theme from the movie Titanic, but we also enjoyed Niño Lindo, un aguinaldo popular Venezolano. We could see all around us, the neighborhoods where these children live. We were in a children’s safe haven amongst all of it. The parents were waiting outside the chain-link fence to pick up their children. “Not safe.” Dani said, simply. I shake my head in confusion and disbelief, and yet in deep perception of what is going on. At night, we party hard. We have a drink at Dani’s family house, meet some wonderful new friends, and best of all, Dani & Gonzalo’s three wonderful children whom I’d met back in New York. Finally, wild luau party down the block. Wow, were we wasted. On Sunday, Richard and I went off and took a Teleferico Tram up El Avila, which was a cultural marvel all in itself: A teeming local tourist trap. What a. . . what a. . . country this is!! I can’t open my eyes wide enough to take it all in. Jon Deak, born in the sand dunes of Indiana of East European parents, is a Composer, Contrabassist, and Educational pioneer. Educated at Oberlin College, the Julliard School, the Conservatorio di Santa Cecilia (Rome) and the University of Illinois, he joined the New York Philharmonic and served as its Associate Principal Bassist for many years, while continuing his professional composing, and studying with Pierre Boulez and Leonard Bernstein. During this time he also introduced ground-breaking performance techniques for the Contrabass, and in his orchestral writing, working with major orchestras across the country. From 1994 – 97 he served as Composer In Residence (sponsored by Meet the Composer) with the Colorado Symphony under Marin Alsop, which is where he initiated the public school program now called The Very Young Composers (VYC). With support from the New York Philharmonic and others, the VYC has grown steadily, winning a national award for excellence in 2004. The program has been introduced in Shanghai, Tokyo, and now in Venezuela, besides serving hundreds of children in eleven New York area Public Schools and such places as New England and Eagle County, Colorado. The New York Philharmonic has premiered 42 works for children, fully orchestrated by the children themselves, mostly under the ages of 13, as well as hundreds of chamber works in the public schools and libraries. I am almost as excited about your being involved with the kids of El Sistema as you are! I can understand the kids’ hesitancy to share their original compositions. It sounds very much like the same shyness that one encounters when kids after age 9 or so are first introduced to play writing or drawing from observation, or acting improvisationally. No matter how talented kids may be, no matter how well developed their technical and emotive skills are, they are still shy kids apprehensive about losing face. I love the fact that you are there sharing YOUR sistema for unleashing their compositional strength and loosening them up without tipping over the lifeline of structure that helps them not only survive but flourish. Cannot wait to read your next blog! Sounds like you were having a wonderful time Jon. And fulfilling; i imagine the children really appreciated it too.